Levant was also published in Greek in 2012 by Oceanida (www.oceanida.gr, ISBN 978-960-410-674-5) and in Italian in 2016 by Mondadori (www.librimondadori.it, ISBN 978-88-04-66134-4). Levant is a book of cities. It describes Smyrna, Alexandria and Beirut when they were windows on the world, escapes from nationality and tradition, centres of wealth, pleasure and freedom. Smyrna, Alexandria and Beirut challenge stereotypes. They were both cosmopolitan cities and centres of nationalism. Using unpublished family papers, the author describes their colourful, contradictory history, from the beginning of the French alliance with the Ottoman Empire in the sixteenth century to their decline in the mid twentieth century: Smyrna was burnt; Alexandria Egyptianised; Beirut lacerated by civil war. Levant is the first history in English of these cities in the modern age. It is also a challenge from history. It is about ourselves; it shows how Muslims, Christians and Jews have lived together in cities. Levantine compromises, putting deals before ideals, pragmatism before ideology, made these cities work, until states reclaimed them for nationalism. Smyrna, Alexandria and Beirut have a message for today. 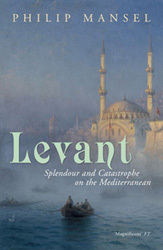 In 2011 Levant was chosen as one of their Books of the Year by the New Statesman and the Times Literary Supplement.